The topic of concussions in football has steadily gained traction over the past couple decades, with more research focused on protecting players than ever before. During this interregnum between last season and the upcoming spring game, let’s explore head injuries. They have a huge impact on the game we enjoy. Concussions affect the following key groups: the individual, the team, the game, the fans and the money. Let’s define exactly what “getting your bell rung” really is! A concussion is a traumatic brain injury caused by a sudden blunt force impact. This can and does lead to physical and mental impairment. Far more dangerous is CTE (chronic traumatic encephalopathy), a possible result of repeated head trauma. These play-related, repeated head blows can lead to the following symptoms: sleep deprivation disturbances, anxiety, depression, cognitive dissonance or disorientation, premature death from neuronal breakdown, and of course in the extreme case, even suicide. A recent article from The Sport Journal highlights CTE and suicides in former NFL players, via repeated violent, accumulative injuries to all aspects of the body including the brain. How is this serious problem to be solved? Or is the game of football heading the way of the Passenger Pigeon? In the litigious society we all live with, will lawyers and those who bring suits to bear make the game economically unfeasible? There is enormous money involved in both college and professional football for the law to take notice. We are seeing helmet manufacturing companies increasingly pay huge insurance costs to cover liability claims that may well drive them out of business. If, in the future, they are unable to obtain coverage, then a potential significant counter-weight to the future success of the game is in play. 1. Change the type of game played. Play flag football! It is fast, fun and removes 95 percent of head trauma. In this world of gender equality, women could play, too. However grabbing those yellow or pink flags could risk tearing shorts or even more important stuff! Okay, this is clearly not a serious option — yet, it could be fun to see. 2. The Targeting Rule is a move in the right direction; however, ejection punishes the player excessively. How about this idea: loss of possession immediately, and the offending player sits a quarter. Penalties and rules all need amending to protect athletes and their teams. A reasonable attempt to minimize head hunters — both actual and inadvertent — will work if implemented in new ways. 3. Teach better tackling, technique and discipline in practice and on the gridiron. Using the hands effectively with no tackling above the shoulders, akin to face mask infractions currently in place, will help. Dock coach pay for repeated head-contact violations. Hitting them in the pocket book will work; why not try it? 4. Something we can always expect — technological equipment breakthroughs. Viscis ZERO1 Helmets have incorporated sensors in helmets to monitor impact forces, which is critical. What about the use of miniature ‘airbag-like’ devices to nullify extreme force instantly, to protect “those little gray cells” from damage? Folks with smarts are working feverishly on this solution. Don’t give us the cost bromide either; big money means big changes are necessary. The neurons and synapses deserve it! 5. Concussion Protocol. We know that repeated ‘crushes to the cranium’ have a force multiplier effect on the extent of brain damage. More concussions, even with less severe trauma than the initial injury, have an accumulative impact on long-term brain health and viability. Clearly this concept is late to the dance, but helps mitigate future repeated trauma. 6. Recruit athletes with thicker skulls, or are they and would they become eventual numskulls? Kidding of course — but this is no laughing matter. The real question is: are some athletes predisposed to head injuries and others not so much? Looks a lot like a potential Master’s Thesis, huh? Indeed there is a developing societal schism among many parents with their athlete kids. On one side of the coin sit those who see a possible potential college education and stardom as the only option from socially disadvantaged backgrounds. The flip side includes parents striving to guide athletes to baseball, soccer, tennis, track and field or other less dangerous athletic pursuits. Why? They have assets to safeguard and minimize their children’s cranial health with other successful athletic endeavors. 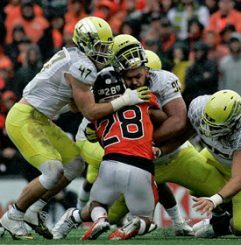 Think back to the Alamo Bowl and how ‘taking a short nap’ affected that recent game. 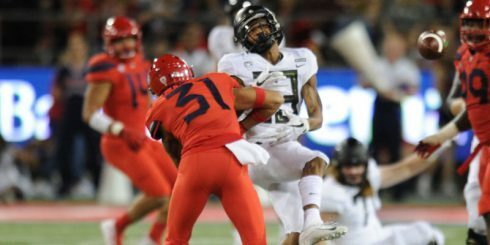 If Vernon Adams does not get concussed against TCU in the first half, the biggest second-half collapse in bowl history never happens! We win that game going away, instead of coulda would shoulda! 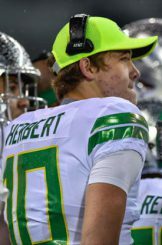 Justin Herbert got ‘head-butted‘ against Arizona and Washington last season and needed sideline evaluations before he could re-enter both those games. How many more cumulative ‘cranial crashes’ can he safely take? 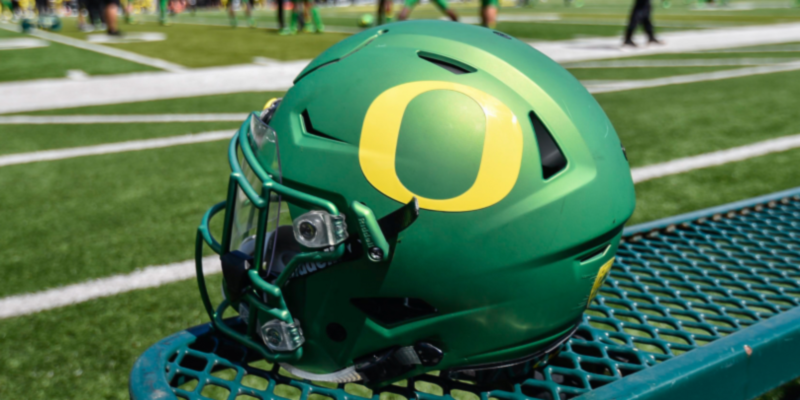 Oregon has a small tightrope to walk next season for him to stay on the field, healthy for both his own well being and for optimal team performance. The Ducks’ entire season could become a metaphor of “hitting their collective heads against the proverbial brick wall,” with another ‘brain-biffing,‘ to him or other key Duck players. It needs to stop. In summation, concussions not only injure players but cost teams wins — often times at critical junctures of the season. Fans begin to lose interest without championships, and revenue declines often precipitously as a result. The game we enjoy is then truly ‘smacked right along side the head,’ and football as we currently know it is in jeopardy! Vital changes must happen with the talent displayed on and off the field to correct brain trauma, which mandates solutions now, not later. Here’s hoping it will. What is your take? Do you have suggestions to keep college football viable in the 21st century? Is the dome doomed?